SICILY. Himera. Circa 430 B.C. Æ hemilitron. 15.03 gm. 23 mm. Cast coinage, reduced standard. 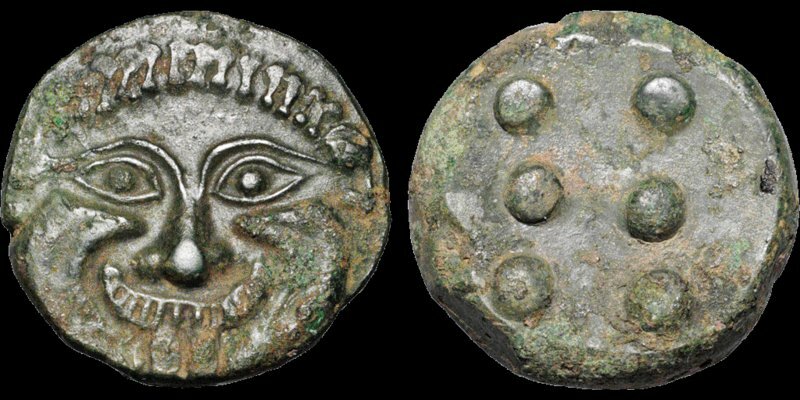 A facing Gorgon with protruding tongue and furrowed cheeks / Six pellets (mark of value). CNS I p. 34, 24. SNG ANS 180. Extremely Fine; rich glossy green patina; minor areas of roughness. Exceptional example for issue. Purchased from Edward J. Waddell (tag).